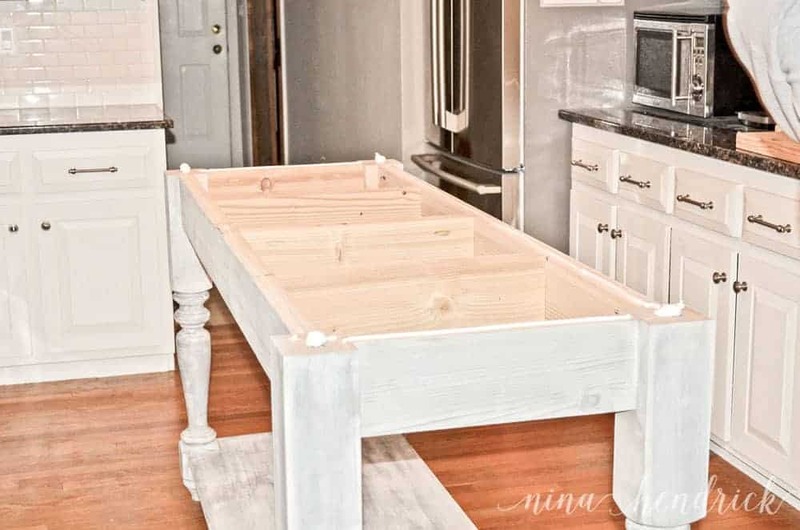 Learn how to build this gorgeous furniture-style DIY kitchen island with this tutorial and free step-by-step building plans from Nina Hendrick Design Co.! Today I’m sharing this unexpected but very welcome addition to our DIY painted kitchen renovation: our DIY Kitchen Island! There is usually a lot of trial and error that goes on behind the scenes of our projects- but everything here seemed to just kind of fall into place. We enjoyed it while it lasted since we know it won’t be that easy again! I hadn’t actually been planning on having an island during this phase of the project. When our heating project required a vent in the middle of the room, we were suddenly scrambling to figure out what we wanted to do to cover it up. We knew that a vent just sitting there would either be tripped on or would soon be stuffed with Cheez-its and goldfish, courtesy of Cooper. So we began discussing options. I originally had this awesome plan in my head for a future island that included a built-in microwave, storage, and a barstool bench. After getting out the measuring tape and making a painter’s tape silhouette, it was pretty clear that we did not have enough space for any of my grand ideas. Long story short, there would not have been enough room to maneuver and open cupboards. I really loved the idea of a furniture style, and Mack and I agreed that it would be the best fit for our space. He went on a marble hunt while I tried to find some plans and legs. Honestly, we are always kind of on the hunt for marble on Craigslist. Since it has become more popular, a lot of people know what they have and the prices become higher than a brand new slab. That was not the case with this listing. The seller was only asking $250, but there were no photos or dimensions. Mack emailed him asking for more info, and we got a grainy photo of a corner of the slab with the disclaimer that it had a scratch- but the dimensions were absolutely perfect, I kid you not. I was still feeling pretty skeptical when we drove out to look at it. It was about 45 minutes away. We drove up to a pretty farmhouse (which I wanted to photograph, but Mack said that would be creepy) and I suddenly got a really good feeling about the whole thing. They obviously had good taste! The marble slab was tucked away in the corner of the garage, and it hadn’t moved in the years since they had it. The edges were unfinished and a bit damaged, but the scratch was actually on the bottom of the slab- when we turned it over the other side was perfect! The seller hadn’t realized there was a difference between the top and bottom. Other than being a bit dirty, it was a real find! Mack was even able to talk the seller down to $200 since the edges would have to be finished. The owner was just happy to have it out of his garage! While the slab was having its edges finished, I began comparing island legs. The ones I decided on came from Osborne Wood Products, and are available here. I chose them based on the dimensions, customer reviews of the company, and the fact that they were just the most pretty! I liked the chunky style in order to support the heavy marble. We are so so happy with the quality of the legs. For the specifics on how to build the island, we decided to wing it. We studied a lot of building plans in the process, but ultimately the plan ended up being a unique build. I created a free PDF of the building plans, which you can get by clicking the link above! We ordered a Kreg Jig, and I have to say- I love it! I am still overcoming my fear and aversion of saws (particularly the table saw), but drilling and assembling pieces is so easy now! 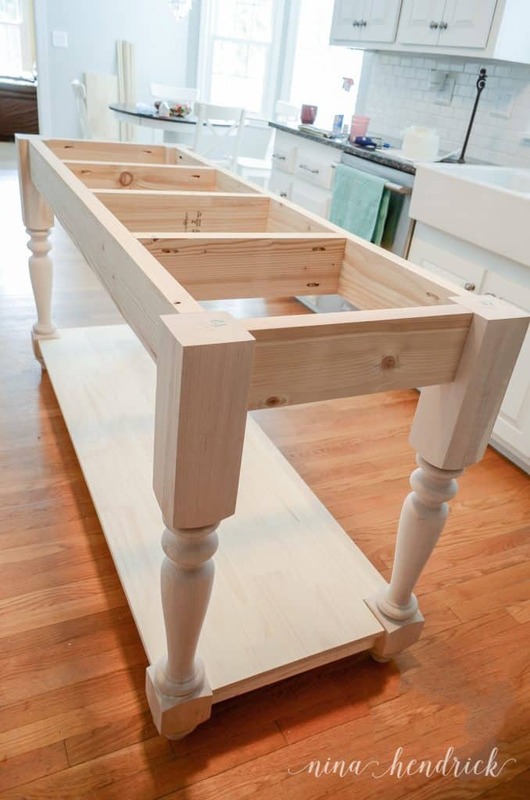 For assembling the island, we really recommend following our plans, but here is a quick tip: to make sure the apron is completely centered on the legs, cut spacers and clamp everything together. That way it won’t shift as you add the screws! We built the ends first, then attached them with the bottom shelf support. Putting blocks under the shelf support added stability as we attached the two sides. For the shelf, we opted to go with a piece of butcher block. We cut notches out for the legs using the circular saw. Here she is in her final home, waiting for the finish. I will share that tutorial another day and update this then! We are so pleased with how it turned out! I think it added just the right amount of contrast to the kitchen project. People often ask where it’s from. A lot of people guess Restoration Hardware before I tell them it was a DIY build! Also, I can’t stop petting the marble… someone is going to have me committed. I’m pretty sure every new countertop in the house will be marble! Especially with Craigslist finds like this one! The marble top was the perfect touch! P.S. Nina…. You can always get a few barstools, to HANG OUT and gaze at your beautiful Marble!!! I absolutely LOVE this island and it is JUST the right look an size (by eye) for my kitchen. I woud love to build this to your spec, any chance your building instructions are documeted for sharing with Fans??? WOW! I love it and the fact that you lucked out on that marble top is awesome!! You did a great job and the color and everything is perfect for your kitchen. i am a huge white kitchen gal myself!! Stopping in from Inspire me Please blog hop. This is stunning!!! You did a fabulous job and it really makes the kitchen. Love it. I love this! I wonder how hard it would be to adjust it into a kitchen table instead of an island and still keep the look! or if it would work as a table with the bottom on it…it probably would not be stable if just the top was just extended out further! don’t want a table falling over on me! Did not see the measurements…will have to look on the Ana’s web sit for her plans that you mentioned! This is gorgeous! Beautiful kitchen too! I love it! Gotta share! Thank you so much Heather! I appreciate it!! Who would think you ruined this with that gorgeous finish!! I can’t believe you made this island. That is gorgeous. Pinning right now. If you have time, come share at my link party that opens tomorrow at 1:00 PST. Love it! That is so fabulous. You lucky girl! I am thrilled you joined my Wow party, but the button you added is not linked to my blog. I had gotten a moderation notice from inlinkz. I hope you can fix it or just add a highlighted link. You will truly enjoy this wonderful island. I would have fun just adding stuff to the bottom shelf. Thank you so much Kim! :) I added a text link- I apologize that it wasn’t working!! 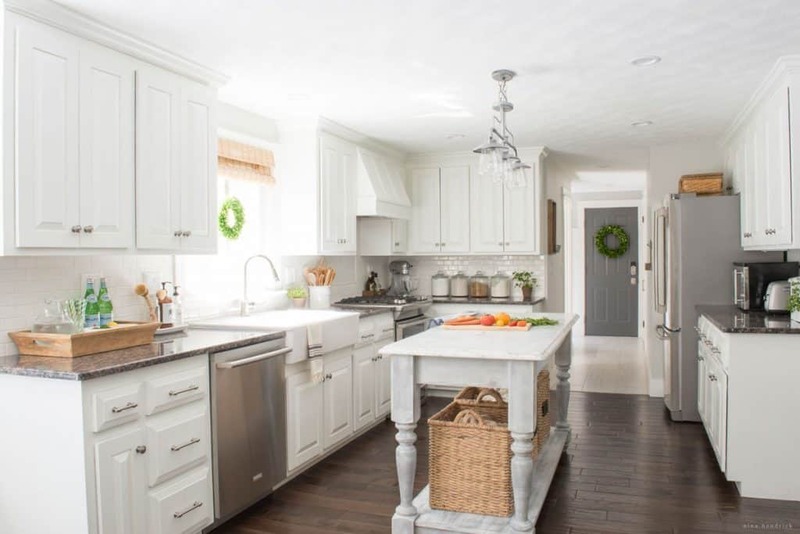 I saw that same island on a Houzz site and had a similar one built for my kitchen – but I took in a totally different direction. My countertops are quartz (but look like marble), so I had butcher block put on the island and the island itself is dark walnut, but the shape, size and style are from that same inspiration photo. You have excellent taste! That sounds lovely Beth :) We toyed with the idea of a dark walnut finish, but since our eventual flooring will probably be walnut, we wanted something that would pop against it. I LOVE walnut though! What an over the top – spectacular island – I can’t believe it’s a diy – or how luck you got with that gorgeous slab!!! just beautiful! I have yet to build anything off of ana whites plans but everything everyone does has turned out so amazing! featuring this in my weekly wow’s on friday. Thank you so much Laura! I appreciate the feature!! I highly recommend Ana, her plans are so spot on- especially since she maximizes the yields so less goes to waste! Beautiful build. Love the stain/paint process you used and the marble top just finishes it off. Great job. The island fit in great with the rest of the kitchen. I really like the finish that you decided on. Provides a rustic look. I absolutely love this! I wouldn’t have thought to look for marble on craigslist–what a score! I’m curious about the total cost of the lumber? Was it pretty reasonable? 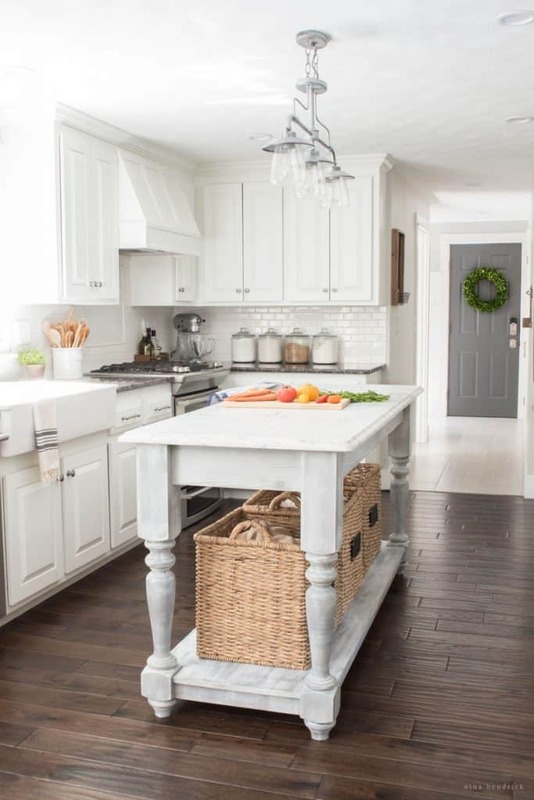 I love this kitchen island the stain looks great. I want to make one!!! Thank you for sharing! How much was it to get the edges finished on your marble top? We are thinking of buying a remnant in similar size and I am trying to set a budget before we buy the materials. Hi Lauren! It was an extra $250 to have the edges finished. We were told that it would have been less if we had bought the remnant from the stone fabricator. I hope that helps! I am in love with this island (and your kitchen)! What are the final measurements of your island and marble top? This might be just what we need for our kitchen! Hi, Beautiful island. What are the dimensions? What are the dimensions of your kitchen? I’m trying to see if I can fit an island like this in my kitchen thanks!! I love the island and want one just like this. Sadly my husband is not handy in that way. Would love to find someone who could take your plans and build for me. Any suggestions would be greatly appreciated. It’s beautiful! I love it and I’m thinking about building one. Thanks for the inspiration! Ma quanto sei brava! Meraviglioso.saluti dall’ italia! Hello! Love your island. 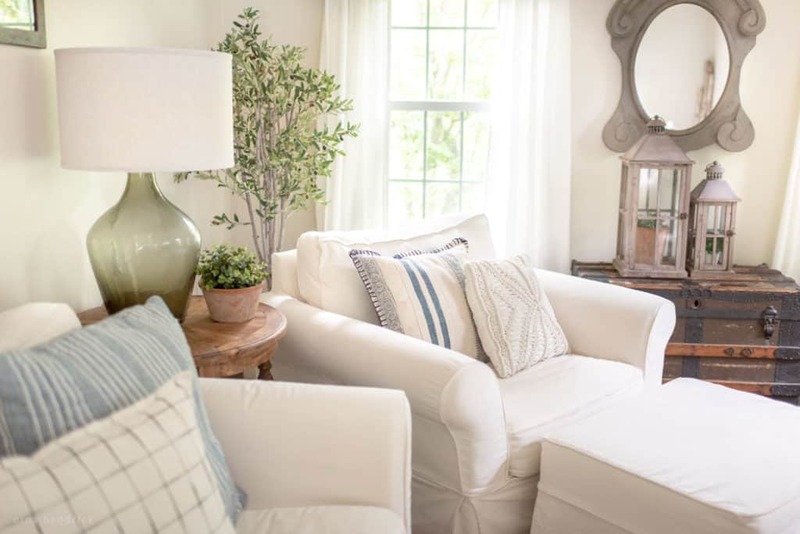 Funny, because I, too, saw that same island on Houzz and have always gone back to it. We will be doing a kitchen remodel and I had the same dreams of an island, but know we don’t have the room either. I decided we will just build one like this because we have used Ana White’s plans for other things and are familiar with Osbourne Wood thanks to various blogs. I was so happy to come across your project to see it can be done beautifully. Great job! I’m inspired by your kitchen island. 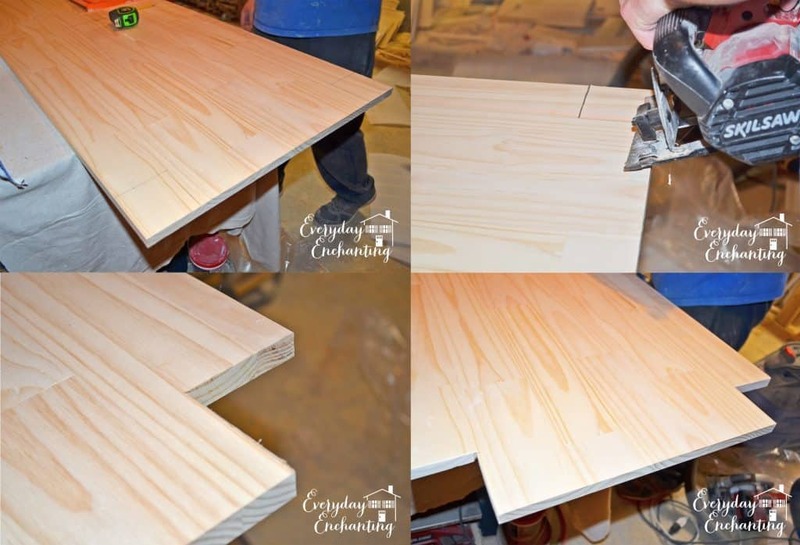 The link that you provided for the legs is for knotty pine…was that the wood species you used and if so we’re there a lot of knots in the wood that you had to address so they didn’t bleed through your stain? Also, if you had to do the island again, would you have used a slightly taller leg that Osborn offers? Hi Sandra, We did use the knotty pine. There were a couple of knots, but we were going for a weathered/rustic look. We have also used their soft maple legs with great results! The island is counter height, which is perfect, so we weren’t looking to go any taller! Love it !!! We are trying to restore a 1908 house in Chelmsford. I now have some hope for my brown 70’s kitchen!! Thank you!! thank you for the tutorial. love the island. 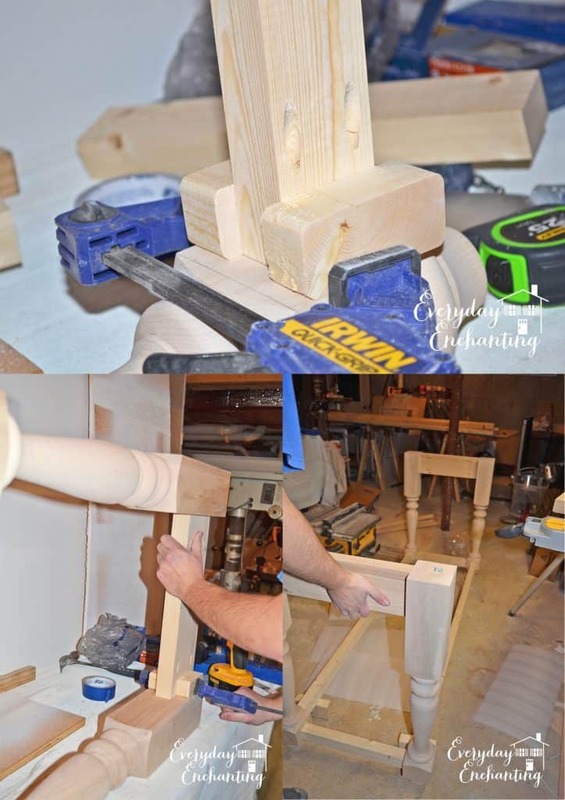 Just found this on Pinterest – looking for ways too turn my antique marble table into an island. PERFECT! Would you mind telling me the dimension of your slab? So sorry to have to ask, but I have looked and looked for the link to the finish tutorial and cannot find it! Can you help? I followed your advice here and my Dad made me a scaled down version for my kitchen! The marble is being edged and I can’t wait to get to work on the finish. Thank you so much! I apologize, I have not added a finish tutorial- I used a gray water based stain (the brand/color I used is no longer available, but there should be similar options). 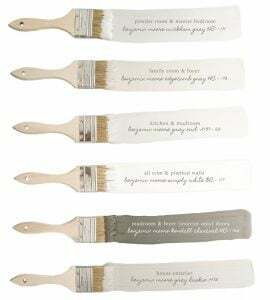 Then I alternated dry brushing gray and white chalky paint and sanding until I got the finish I was going for. It was not a linear process, unfortunately- which was what made a tutorial so difficult. It was the classic “eyeballing it” scenario. I love it, you guys did such a great job. I love Non traditional stuff. I will share it with my readers. This is beautiful! I made one very similar but with a maple top! I also added a drop leaf to one side! I am shocked at how similar they are! I made mine about 8 years ago and when I saw yours it made my day! I am now considering a slab of soapstone for the top to replace the maple! 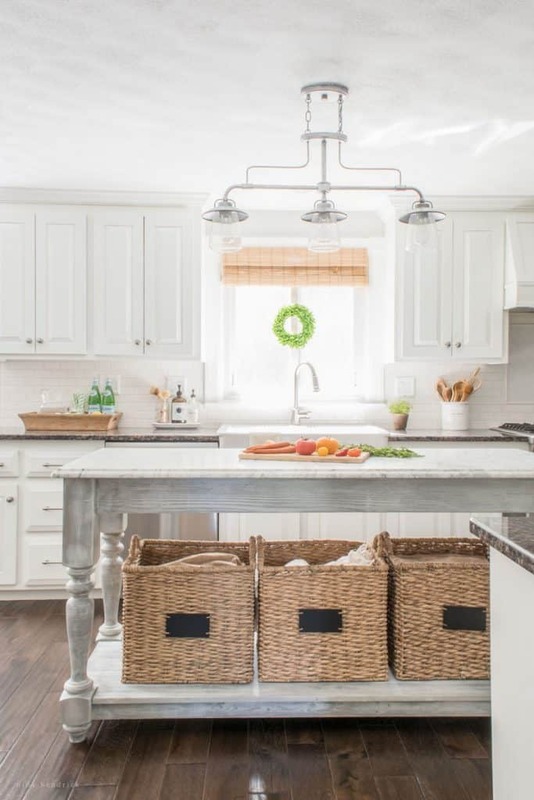 I even have very similar baskets on the bottom shelf! I also have a shelf above the bottom shelf about 9 inches from the top! Yours is stunning. That sounds beautiful! Thank you so much for the kind words.